On March 14, 1945, a British Lancaster heavy bomber dropped a bomb known as the “Grand Slam,” a 22,000 lb behemoth that was the largest and most powerful bomb ever used up to that time. For years, only a nuclear bomb would be more powerful. 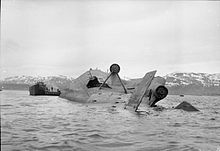 British weapons designer extraordinaire, Barnes Wallis, designed numerous ingenious weapons, including the “Tall Boy” bomb, a 12,000 pound monster “earthquake” bomb that was used to attack hardened targets such a submarine pens and the German battleship Tirpitz (which was finally sunk with Tall Boys). Wallis also designed the “bouncing bomb” that was used to destroy dams in German held areas. An “earthquake bomb” is so named because it does not have to hit its target, just bury itself deep in the earth before blowing up, causing shockwaves through the ground similar to an earthquake, destroying reinforced concrete and other materials indirectly. The bombs are constructed with heavier than normal casings on the front to allow deep penetration into the ground, and a delay fuse ensures the explosion takes place below the surface. When the vast amount of explosive (Torpex) is poured into the bomb casing, it takes a month to cool and harden! The only bomber capable of dropping a Grand Slam during World War II was the Avro Lancaster, a 4 engine heavy bomber considered by the British to be the finest bomber of World War II. More or less similar to US B-17 and B-24 bombers, the Lancaster could carry a larger and heavier load, though it was not quite as heavily armed with machine guns. The Grand Slam was so big it had to be carried externally under the belly of the Lancaster. On March 14, 1945, the Grand Slam made its combat debut when it was dropped from about 12,000 feet with the target being the Schildesche Viaduct near Bielefeld, Germany. The giant bomb did its job, and the viaduct was destroyed. This mission included several Grand Slam bombs and some Tall Boys thrown in for good measure. 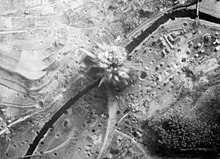 Several missions using the big bombs followed, with targets including viaducts, bridges and submarine pens. Tall Boys and Grand Slams were usually used together. The idea of a giant blast without the nuclear fallout was resurrected by the United States during the Vietnam War when the BLU-82 bomb known as the “Daisy Cutter” weighing 15,000 pounds was used to create instant helicopter landing zones in the jungle. In 2003 the GBU-43/B Massive Ordnance Air Burst (MOAB) bomb was introduced, a 22,600 pound bomb stretched over 30 feet long and was touted as the most powerful non-nuclear bomb ever made at that time. Obviously, the nickname, “Mother of All Bombs” was used by air crews! Too big for any current bomber, the Daisy Cutter and MOAB were dropped by C-130 Hercules cargo planes. Not to be one upped by the US, Russia followed in the big bomb race with the Aviation Thermobaric Bomb of Increased Power (ATBIP), a weapon quickly gaining the nickname, “Father of All Bombs.” First tested in 2007, this Russian Air Force weapon weighs “only” 15,650 pounds, but has the blast characteristics of 88,000 pounds of TNT! It is indeed likely the most powerful non-nuclear bomb ever made, with about 4 times the blast effect than the MOAB. Both the MOAB and the FOAB are air-burst type bombs rather than the earthquake type. Both the US and Russia plan to use these bombs in lieu of nukes, but with similar blast effect to a small nuke. The US also developed various thermobaric type bombs, including Fuel Air Explosive (FAE) types, also sometimes called “The poor man’s nuke.” These bombs send a shock wave farther than any conventional bomb and are ideal for attacking targets such as bunkers and caves. Even terrorists have gotten on the FAE bandwagon, starting with the bomb that blew up the US Marine barracks building in Beirut in 1983, and later with the 1993 attack on the World Trade Center. Ever since pilots began dropping hand grenades and then mortar shells out of open cockpit bi-planes at the start of World War I, air forces have come up with increasingly effective and deadly bombs, some showing incredible ingenuity. Questions for Students (and others): What bombs do you find most interesting? Are there any that you would like us to write about? Please let us know in the comments section below this article. Flower, Stephen. Barnes Wallis’ Bombs: Tallboy, Dambuster & Grand Slam (Revealing History). Tempus Pub Ltd, 2004. The featured image in this article, a Royal Air Force oblique photographic-reconnaissance aerial of the twin railway viaducts at Schildesche, Bielefeld (Germany), following the successful daylight attack by 15 Avro Lancasters of No. 617 Squadron RAF on 14 March 1945, is photograph C 5086 from the collections of the Imperial War Museums. This work created by the United Kingdom Government is in the public domain. Previous ArticleMarch 13, 1997: “Phoenix Lights” UFO Witnessed by Governor of Arizona!